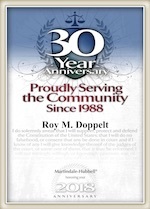 The Law Offices of Doppelt and Forney, APLC practice all aspects of family law. This includes all divorce, legal separation and paternity cases. From high-asset divorce to child support and child custody & visitation, we are here to help. At the consultation, an experienced attorney will give you legal analysis and provide you with strategies to try and obtain your goals and protect your rights. We can run guideline child and spousal support calculations so you have realistic expectations. We are here to help you through motions for spousal support, child support and visitation child custody, attorney’s fees, and more. We can also assist with the preparation for mandatory family court services mediation. And of course, we will negotiation with opposing counsel and/or opposing party to try to settle the case if possible. Call today for a free consultation to learn more about how The Law Offices of Doppelt and Forney, APLC can help you through your family law case in San Diego. Marriage can be extremely hard work, and there are many factors that can make marriage even harder. While risk factors don’t cause divorce, they do increase a couple’s chances of splitting. Don’t go through your divorce, legal separation or paternity case alone. Call the San Diego divorce lawyers at The Law Offices of Doppelt and Forney, APLC. We are here to help you through this difficult time. Contact us today to set up a free consultation with one of our experienced lawyers. It is not uncommon for people in family court to represent themselves, but there are risks that come with self-representation. People who divorce without the expertise of an attorney may put themselves at greater risk for mistakes, delays and added stress. The biggest risk would, of course, be losing your case.